Oh boy, I’ve been waiting to do this post for ages. It’s taken me a while to visit all these bathrooms, but I’ve finally done it – and I got photographs of all of them! I don’t think the Baberoo enjoyed being wheeled from toilet to toilet all through town just so I could take photos of the loos, but I did it so that other babies (and parents) can benefit. In this guide I’ve only included baby-changing bathrooms located in shops, department stores, or shopping centres, as well as public conveniences. Anything that’s in a restaurant or café has NOT been included in this list, since I will eventually review those individually when I go to that café or restaurant (that’s to keep you reading my blog!). Same goes for museums and attractions – those loos will be included in my write-up of that attraction. So here it is: a guide to eight baby-changing facilities (good and bad) in the Oxford city centre. A photo follows each description. Debenhams (Magdalen Street, OX1 3AA): The Debenhams baby-changing room is well-known by many a parent, as evidenced by the constant queue of prams waiting to get in. Even when you’re waiting to cross the street to get to Debenhams you can tell which parents are desperate: they’re the ones white-knuckling their strollers, ready to race across as soon as the light changes so they can be first in the queue for the lift. I don’t blame them; I’ve done it myself. 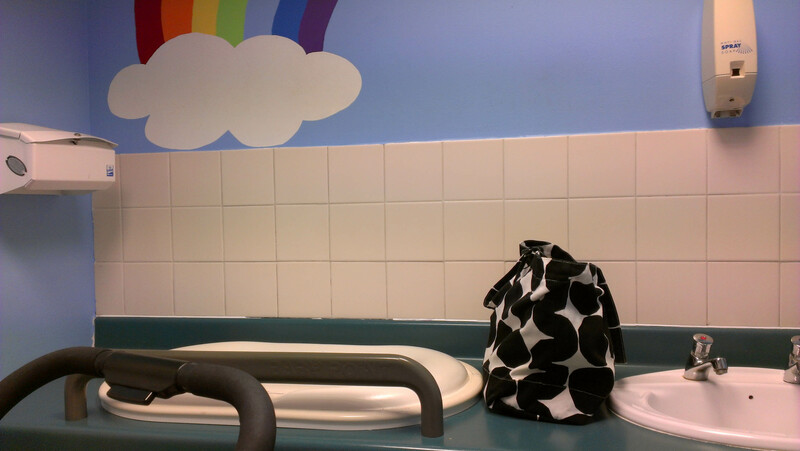 The baby-changing room is on the third floor along with the rest of the loos. It’s a fair size and has a reasonable amount of counter space next to the built-in changing table, and it also has a toilet for parents to use. It’s usually clean, although the low lighting makes it seem dingy. Unfortunately, Debenhams has a constant stream of very loud music and advertisements playing in the loo, which is fine (and may be useful as a distraction) when your kid needs to be changed, but very, very annoying when it’s you who has to use the toilet and your baby is sleeping, because the noise is certain to wake them up. The very narrow corridor leading to the room is somewhat awkward to manoeuvre through, and since the signage is terrible, you will usually meet at least one confused woman who is just trying to find the ladies’ loos (they’re a bit further down the main corridor and to the right). 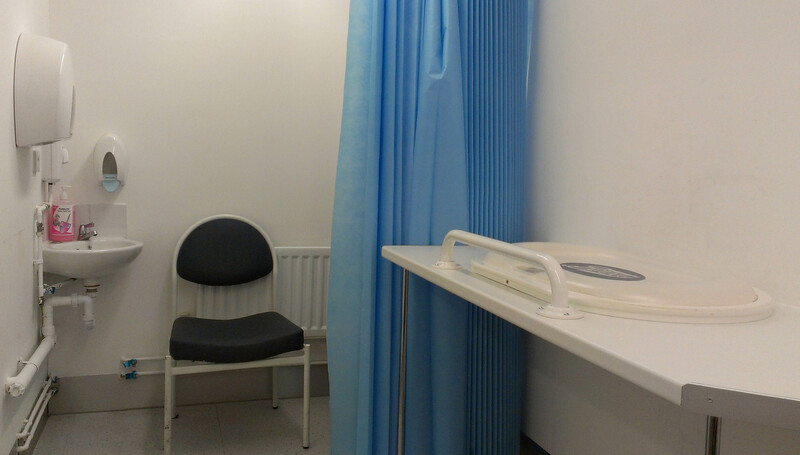 Debenhams also has a room opposite the baby-changing room where you can breastfeed your baby in private, although its plastic bucket seats would not be my first choice for a comfortable feed. Still, this facility is a tried-and-true one for most parents. BHS (22 Queen Street, OX1 1EP): You can tell when a shop has experienced bathroom vandalism by how many signs they post warning you that the bathroom is only for customers of that shop. BHS has those signs. The store also keeps its bathrooms private for the use of customers by requiring you to use an entry code (found on the receipt for your purchase, or you can get one from a staff member). However, on the occasion I visited the door was unlocked. The baby-changing room is on the first floor at the back of the shop. It’s a fine size and it has a built-in changing table with reasonable counter space. There’s no toilet for parents. The wall is decorated with a rainbow, I guess to make it more interesting for babies. Strangely, the attendant’s office is located behind a door within the baby-changing room. The attendant was in there when I visited; she closed the door so we could have some privacy but it still felt weird that someone was right in there with us. 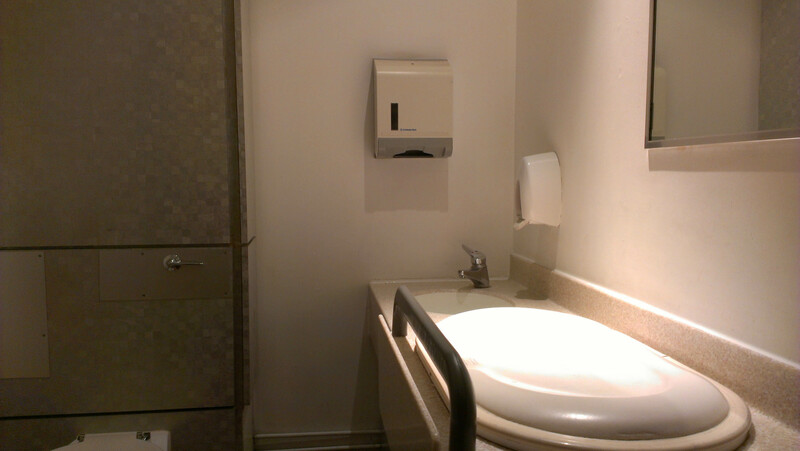 Blackwell’s Bookshop (48-51 Broad Street, OX1 3BQ): Blackwell’s changed their loos not too long ago, so the ladies’ and gents’ are now on the third floor but their disabled/baby-changing facilities remain on the first floor, conveniently close to the lift. There is a short corridor leading to the facility, which – holy of holies – has a door that is not on self-closing hinges, so you don’t have to hold it open while you manoeuvre your stroller into the bathroom. There’s a pull-down baby-changing table of the very narrow kind that a toddler might not fit on. It also means there’s no counter space for your bag, but on the plus side the room is very bright and clean, and it has a toilet that parents can use too. It seems to me that hardly anyone knows about this baby-changing facility; use it while you can before the secret gets out. Boots (6-8 Cornmarket Street, OX1 3HL): The big Boots on Cornmarket Street has a Baby Room with an entry code you’ll need to get from a member of staff – although on the occasion that I visited, the door was open. The room is generously sized, with a built-in changing table and good counter space for a changing bag, but no toilet for parents. There are two padded chairs to use for breastfeeding or for other children to sit on while waiting. There’s also a modesty curtain, although since only one family at a time would be using the facility I’m not sure of its usefulness. It’s a bright, clean bathroom and it seems less well-travelled than some of the other baby-changing facilities downtown. 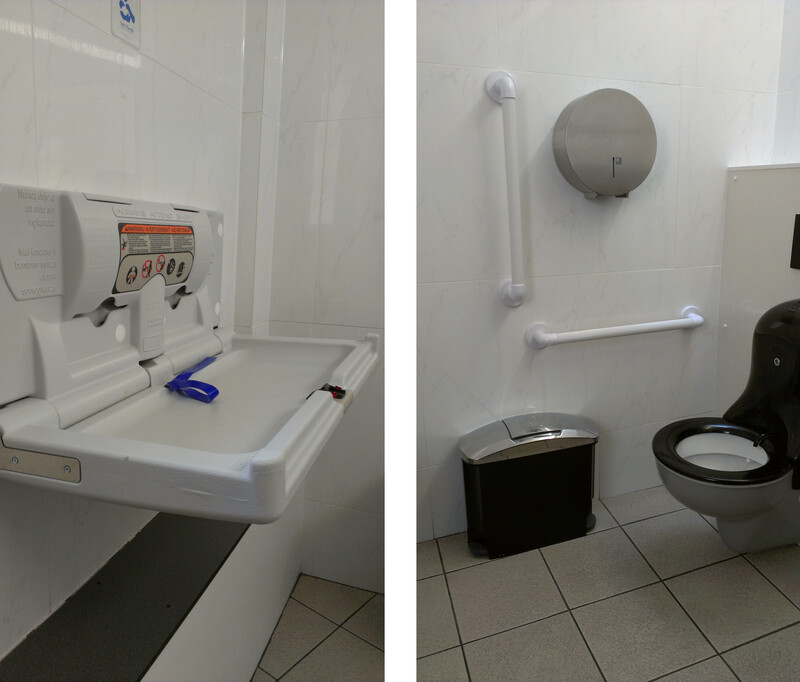 Market Street Public Conveniences (Market Street, behind the Covered Market): I was very pleasantly surprised by the disabled/baby-changing facility in this public convenience. It’s quite large and spacious (so large, in fact, that I had to do a composite photo because I couldn’t fit everything in one shot), clean, and has some natural light via some high windows. It’s only open from 9 am to 5 pm, so you can’t use it in the evening if you’re out with your baby. The changing table is a pull-down one of the very narrow variety that would be too small for toddlers. 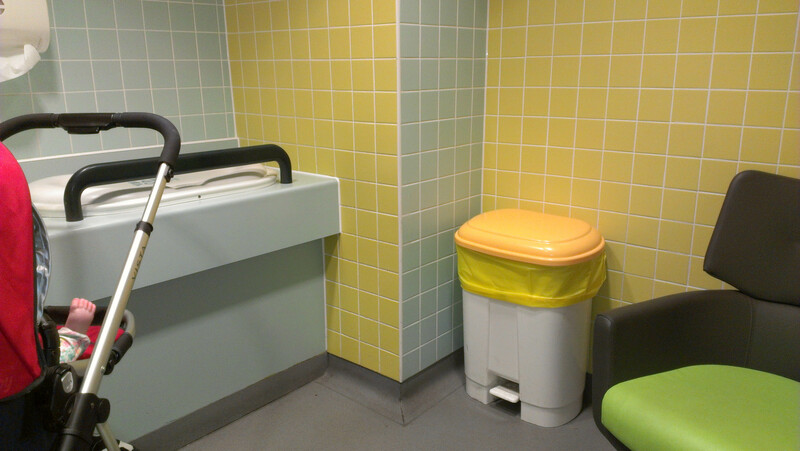 There’s also no counter space for your changing bag; however, there is a toilet that parents can use. The Market Street Public Conveniences got a 4-star rating in the ‘Loo of the Year Awards’ in 2011, which is saying something about their cleanliness and presentableness; kudos to Oxford City Council for keeping them up so well. Waterstones (William Baker House, Broad Street, OX1 3AF): Oh, Waterstones, I hate to have to say this, but your toilets stink, both literally and figuratively. The disabled/baby-changing room, as well as the regular toilet, are both behind doors with codes, all the way up on the third floor. They are not very pleasant; on the occasion I visited there was rubbish on the floor and the loo smelled like sewer (admittedly, this sometimes happens in a basement and there’s very little that can be done about it, but this is the third floor so I don’t know what’s going on here). There is also very little space to manoeuvre a pram; mine nearly didn’t fit into the room. 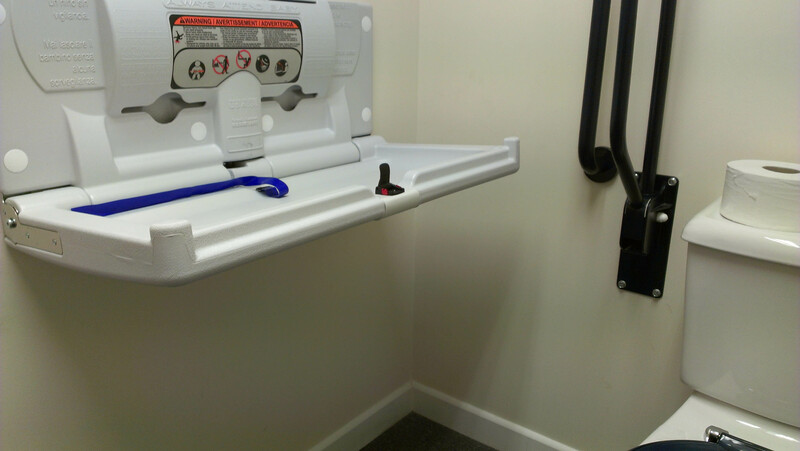 There is a pull-down changing table but no counter space for your changing bag, although there’s a loo that parents can use. These bathrooms detract from the general wonderfulness of Waterstones and I hope they’ll consider upgrading their loos. Westgate Car Park (at the back entrance of Westgate Shopping Centre, Castle Street, OX1 1NZ): I lied at the beginning of this post when I said I had pictures of all the toilets in the guide. I don’t have a photo of this one because it was locked. And it took me 15 minutes to find it due to appalling signage – which I took several pictures of. The composite photo below will attest to the fact that the signs are confusing in the extreme; some point you in one direction while others point you in the exact opposite direction. I must have gone back and forth several times before I realized that the baby-changing facility was in a corridor that had been marked as the ‘Gents’ (handwritten on paper and taped over another sign). I knocked and hallooed and am pretty sure that the room was vacant, especially since it said ‘Vacant’ on the lock. There was no one to ask about unlocking it, so I went away again. 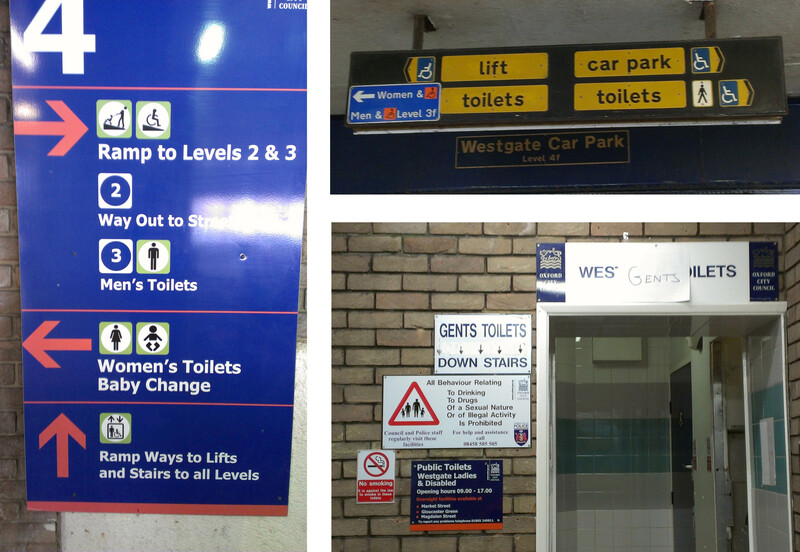 To be fair to Westgate Shopping Centre, these loos are not managed by them but by Oxford City Council. These, I’m fairly sure, have never been awarded any stars by ‘Loo of the Year’. Go somewhere else instead, like the much better Market Street public conveniences. So, there you have it. 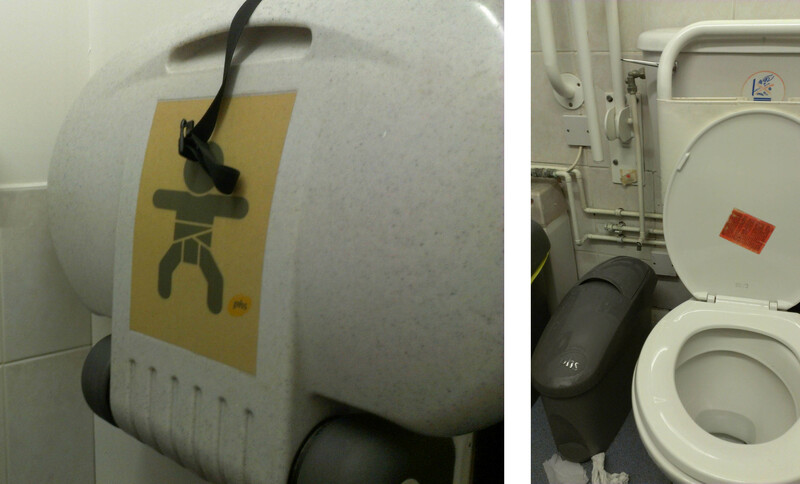 Eight baby-changing facilities in the Oxford city centre, ranging from pretty good to woefully bad. I hope this guide has been useful. Please let me know if I’ve missed out any facilities I should know about and I’ll put them in a future post. Finally, a shout-out here for the NCT’s Babychange App, which lets you search by town, city, or postcode for baby-changing facilities. The rating system is fairly simple and there are no photos, but it’s really useful if you’re somewhere unfamiliar or just need to know where your closest baby-changing station is in case of emergency! Thank you, thank you, thank you!!!! I’ve been here for 6 months (from Canada, too! ), with 3 little ones, and I find the lack of toilets to be so frustrating! This is great information. Thanks, Jennifer! I was just thinking that I did this post a while ago and I may go round town to do it again soon to update any information that’s out of date. I hope your travels around Oxford with your three little ones have been fun so far! Thank you! From another grateful Canadian in Oxford. I had a question about Town Hall and the rail station – in next version could add them if there are any.